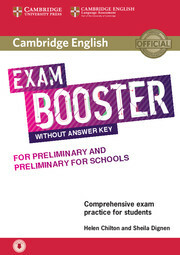 The Teacher's Book contains teaching notes, extra teaching ideas to extend or shorten the length of the activities and clear, comprehensive answer keys. The Teacher's Resources Audio CD/CD-ROM contains: two complete practice tests with audio, 10 progress tests and photocopiable classroom activities. Also on the CD-ROM are the answers and recording scripts for the For Schools Pack Practice Test Booklet which is available separately.